Ladysmith is a picturesque seaside village located on Vancouver Island about a 10-minute drive south of Nanaimo. Harrowsmith Country Magazine named it one of the ten prettiest towns in Canada. 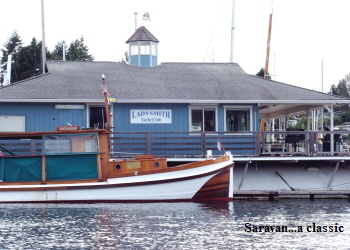 On a recent visit, my wife Sandy and I, with ten other visitors, took a harbour tour offered twice daily during July and August by the Ladysmith Maritime Society. We’re glad we did. Rob Johnson our jovial and informative tour guide gave us an enlightened perspective of Ladysmith, beginning with its history as a coal mining and lumber town. The mines have since closed but the lumber mill is still a thriving industry, although reportedly they may also be closing in the near future. 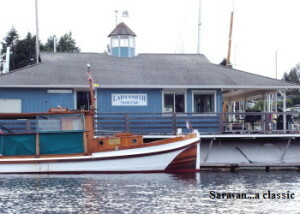 Ladysmith Marina, the Yacht Club, and a boat yard are in close proximity to Fisherman’s Wharf and the Maritime Society docks, both with access to washrooms and showers for visiting boaters. Our tour heads south to nearby Transfer Beach Park which offers a swimming pool, kiddies water-spray park, sandy beach and grassy-sloped amphitheatre, the site of logger sports, fireworks, and many other activities throughout the year. We cross the harbour to Sibell Bay where boaters from the First Nation’s Reserve often train in their massive canoes. A cadre of motor yachts lie gleaming in the sunshine at the docks of the Seattle Yacht Club’s outstation, while a scattering of sailboats are securely anchored between North Dunsmuir and Bute Islands. 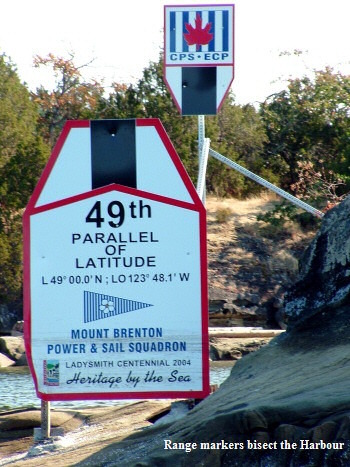 Interestingly, the local Canadian Power and Sail Squadron has set up range markers on both sides of the bay marking the 49th Parallel. Nooks and crannies abound with interesting rock formations, sea life, and seals aplenty — a kayaker’s paradise. 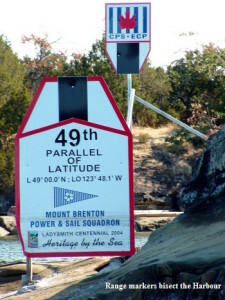 We stop to stretch our legs and walk the docks at Page Point Inn Marina, which offers moorage, fuel, and fine dining. Here on weekends visitors can experience the thrill of racing on one of three America Cup1980-vintage sailboats. Nearing the end of our two-hour tour, Rob excitedly discusses the town’s intentions to further develop its waterfront with walkways, shops, and restaurants for the enjoyment of both residents and tourists. Tour cost is by donation, some of which is used by the Society to maintain two beautifully restored historic wooden boats, which elicited fond memories for a few of the older visitors in our group.